Trumpf is the largest manufacturer of metal fabricating equipment and industrial laser cutting machinery in North America. They provide innovative, high-quality products and solutions that help manufacturers increase efficiency, reduce waste, and maximize both productivity and profitability. For an overview of Trumpf products, explore the links below. And if you’re interested in learning more about Trumpf technology, please contact us today. We look forward to helping you specify the best Trumpf machine for your business. Trumpf lasers have the flexibility to be used in a variety of applications, allowing for short processing times with ideal processing quality. Precision and a high level of automation go hand in hand in Trumpf systems. Today’s manufacturers use lasers for processing a wide variety of products, including car bodies, transmission, exhaust and control system components, sensors, tube and profiles, electronic components, and solar cells. Trumpf lasers repair and coat tools and molds, and can mark anything from pacemakers to apples. 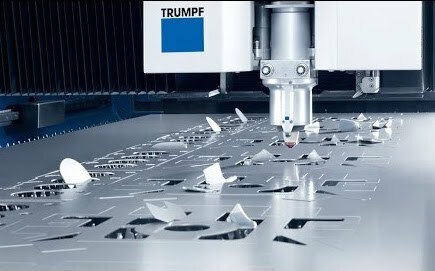 Trumpf laser cutting systems have proven themselves time and time again under today’s toughest manufacturing conditions and in a wide range of industries. If you’re interested in learning more about the latest Trumpf laser cutting systems, please contact us today to learn more and request a quote. TruBend machines incorporate a wealth of experience in press brake technology coupled with pioneering innovations. They enable you to fabricate parts in any format, from the simplest to the most complex, precisely and cost-effectively. Above all, Trumpf press brakes are renowned for their flexibility, finished part quality, and a high cost-benefit ratio. If you’re interested in learning more about the latest Trumpf press brake systems, please contact us today to learn more and request a quote. Trumpf punching technology allows for complex, three-dimensional sheet processing with the goal of complete processing on a single machine. In addition to fully rotatable tooling, there are various components available for our punching machines from simple CNC punching all the way up to fully automated plants. If you’re interested in learning more about the latest Trumpf punching systems, please contact us today to learn more and request a quote. TruMatic machines from Trumpf combine all the benefits of punching and laser processing in a single precision system. They enable you to produce a broad range of parts and handle even the most challenging jobs successfully. The punching head performs standard contouring and forming tasks, while complex contours are cut by the laser. With a TruMatic combination machine, your business will produce parts faster and with more precision than ever before. By combining multiple critical processes within a single machine, Trumpf engineers have crafted a unique manufacturing system that will increase efficiency and maximize output. If you’re interested in learning more about the latest Trumpf combination punching and laser cutting machines, please contact us today to learn more and request a quote.